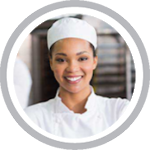 Texas requires food handler safety training for employees in the food service and hospitality industry. Texas food safety training is for employees (such as chefs, cooks, servers, preparers, vendors, caterers, supervisors and managers) who are involved in preparing, storing, or handling food that work in: (restaurants, bars, cafes, bakeries, delis, mobile food trucks, assisted-living, day care centers, and convenience stores). As of September 1, 2016 and as part of the Texas Food Establishment Rules (TFER), all food handler service individuals working in Texas facilities who are involved in preparing, storing, or handling food must now successfully complete an accredited food handler training course. Texas employees have 60 days from date of hire to get their certificate. The Texas Food Handler Training Course is online, easy to use and takes about 2 hours to complete. The course is ANSI-accredited, state-approved and will take you step-by-step through everything you need to know, including food safety definitions, safe hygienic practices, safe food temperatures, cross-contamination of food, and food-related illnesses. All food safety content materials and exams are available in both English and Spanish. Start now and get one step closer to obtaining your Texas food handler’s training card! The Texas Food Handler Training course will discuss the various food safety issues, regulations, and techniques needed to maintain a food-safe environment. It will help the student better understand how handling food correctly is not only the law, but it improves safety and reduces risks. A new statewide mandate that all food employees successfully complete a food handler training course within 60 days of employment. This food handler requirement began on Sept. 1, 2016. Added requirements for the “original” certified food protection manager certificate being posted conspicuous to the customer’s location. Added requirement for food handler certificates to be located on site. We offer Food Safety Training statewide in Texas for: Abilene, Amarillo, Arlington, Austin, Bastrop, Brownsville, Beaumont, Corpus Christi, Dallas, Denton, De Soto, El Paso, Fort Worth, Gainsville, Garland, Grand Prarie, Irving, Killeen, Houston, Laredo, McAllen, Mesquite, Midland, Mineral Wells, New Braunfels, North Richland Hills, Odessa, Pasadena, Pearland, Plano, Port Aransas, Richardson, Round Rock, San Antonio, San Marcos, Schertz, Tyler, Waco, Wichita Falls – Bell County, Bexar County, Comal County, Hays County, Harris County, San Patricio County, Tarrant County, Travis County, Witchita County, and Williamson County, and many more! Getting your Texas Food Handlers Training couldn’t be easier!